Once again Shout! Factory brings us a great lost episode of Mystery Science Theater 3000, The Atomic Brain. From MST3K's season 5, this feature stars Mike Nelson along with his robot co-hosts Crow T. Robot and Tom Servo. This episode is a Shout! Select title only available through Shout! Factory's website. The Atomic Brain follows an devious older woman who wants nothing more than to be young. She has employed a mad doctor to transplant her brain into the body of a young woman. 3 beautiful young women are selected to stay at the woman's home and laboratory. Which woman will be chosen as the body donor and will the transplant be successful? The Atomic Brain is another horrid, no budget film that proves as fodder for the crew of the Satellite of Love. The laughs come frequently, targeting the ridiculousness of the movie's plot. One of the biggest laughs comes from the crew's hilarious quips about one of the young women's horrid attempt at a British accent. Also included with The Atomic Brain is another great short titled What About Juvenile Delinquency? This short follows a group of derelict kids who beat up an older man that turns out to be the father of one of the gang members they were on their way to pick up. The MST3K shorts are always my favorite thing about the series and this one is no exception. Overall this is another episode that gets laughs from start to finish and is sure to please MST3K fans. 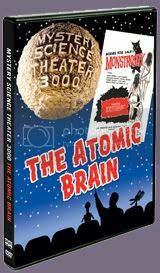 Order The Atomic Brain now along with Touch of Satan and you'll receive a free MST3K Stress Ball (while supplies last).